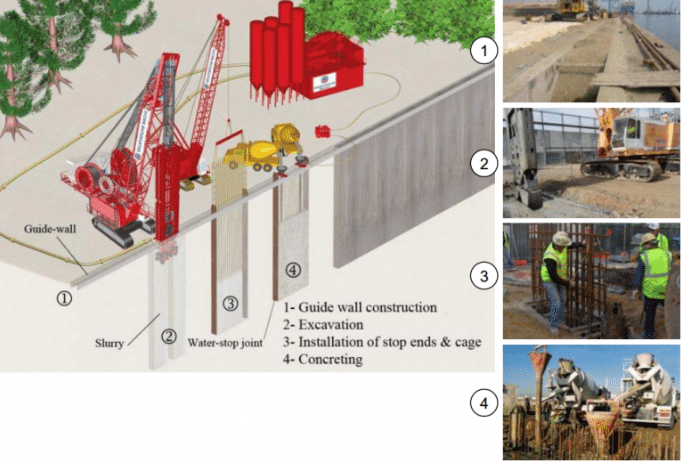 Home/ Geotechnical Engineering / What is a Diaphragm Wall? Diaphragm wall is a continuous reinforced concrete wall constructed in the ground to support major construction activities like the construction of dams, tunnel approaches, deep basements and enclosures. They act as a retaining wall, support for the underground structure, as a foundation or facilitate cut off provision in order to support deep excavation. 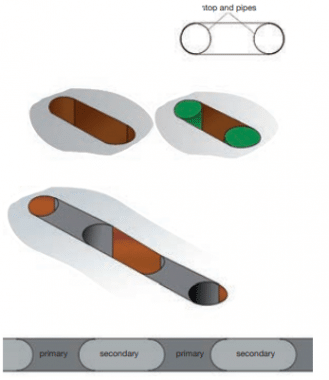 The construction sequence and the varied features of a diaphragm wall are explained in this article. A diaphragm wall forms a rectangular section constructed in-situ under the soil. Hence, this is an underground concrete wall. These walls are constructed panel-by-panel each interlocked to ensure structural stability and water tightness. The diaphragm walls can have a thickness ranging from 60cm to 150cm with a width of 2.0 to 3.5m. The diaphragm walls can be constructed up to a depth of 60m. How to construct a Diaphragm Wall? 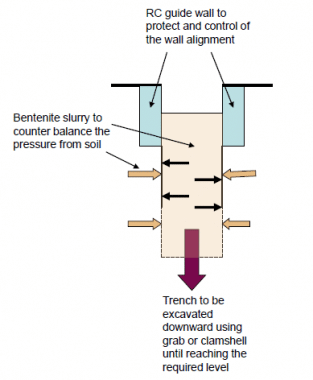 As the slurry levels of soil vary largely, it is necessary to have a temporary support like guide wall. The dimensions of the guide wall constructed changes with the type of surface soil. In case, the water table level in the area is too high, the guide wall is constructed at a height above the ground level to guide the construction. This stage includes soil-removal and stabilisation. A rectangular excavation tool is used to excavate the panel section. A clamshell or grab is used to excavate the trench in normal soil. Grab suspended by a crane or cable easily moves into the soil. If any obstruction is encountered, it is broken by the means of a gravity hammer and taken out by means of the grab. The above procedure must be conducted with adequate excavation support, otherwise, the sides of the excavated trench can collapse. To protect the sides, bentonite slurry is used. The slurry helps in producing lateral pressure that is sufficient to retain the vertical soil. This stage involves the concreting of the panel excavated. Initially, the reinforcement cage is inserted into the trench. If the depth of the diaphragm wall is more, two or more steel reinforcement cages have to be inserted to cover the depth and these cages are lapped. Once the reinforcement is placed, the concrete is poured into the trench with the help of tremie pipes. 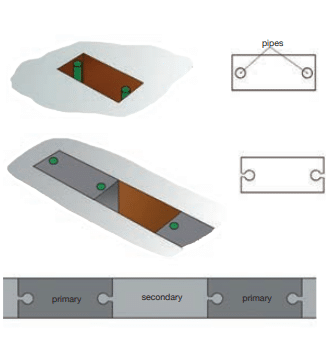 The use of tremie pipes helps to avoid segregation of concrete. The poured concrete replaces the bentonite clay in the trench. The density of bentonite is low compared to concrete hence is replaced during the concreting. The bentonite clay displaced is collected and reused. In this method, two steel pipes are inserted into the trench before concreting, so that after concreting a semi-circular end section panel is obtained. The panel formed with concave ends forms the primary panel. Alternatively, an intermediate section is formed where the secondary panel is constructed. Once the primary panel is made, the secondary panels are executed. In this method, two pipes are arranged at the ends of the steel reinforcement cage of the panel. The concreting is performed for the primary panel leaving the pipes with slurry. During the concreting of the secondary panel using a dedicated tool, the separation is broken as shown in figure -4 below. A round indentation is made in the primary panel in connection with secondary. While concreting the secondary panel, the indentation too is filled thus making a joint with the primary panel.